Pat has been involved with pipe bands and drumming almost his entire life. His father was a Pipe Band member and Pat become involved as a young child. 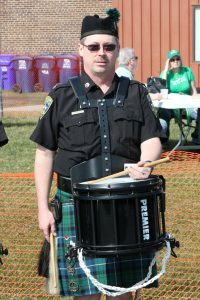 Pat’s son Nick was also plays pips band snare and was recently promoted to Drum Sargent of the band he performs with in Ohio. The O’Hare’s can claim three generations of Pipe Band musicians.